A user having full mailbox access on another mailbox can have that mailbox added in outlook profile so that he/she don’t have to logon to that mailbox separately. This has been a regular practice for many organization. Normally a support mailbox where all support requests are stored is a common example of an additional mailbox added to outlook profiles. Outlook 2007 and earlier version did the job very well but there was always a limitation in case an outlook profile needs to reconfigured or the user’s computer changes. User or the IT support needed to add the additional mailbox back to user’s profile. How about an idea where user’s/IT support don’t need to add additional mailboxes once they are configured? Yes. That is very much possible if you are running Exchange 2010 SP1 and Outlook 2010. Let’s take a look at how to get this working. First you need grant Full Mailbox Access to the additional mailbox you are willing to add in outlook. In my case I have a support mailbox which is added in a user’s profile named Exchange Geek. Use EMC or EMS to grant full mailbox access permission to support mailbox. Now click on Add button and add the user account which needs full access. After this get back to the desktop where outlook is installed. 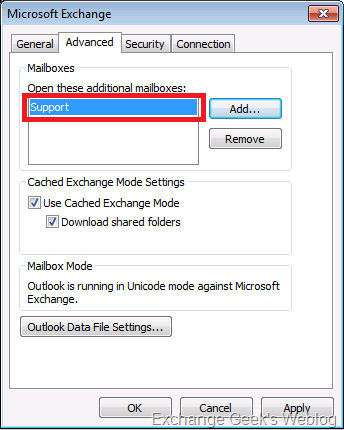 I configure an outlook profile for user Exchange Geek and add the Support Mailbox in the profile. So, How it works even after you lose your windows profile or outlook profile? 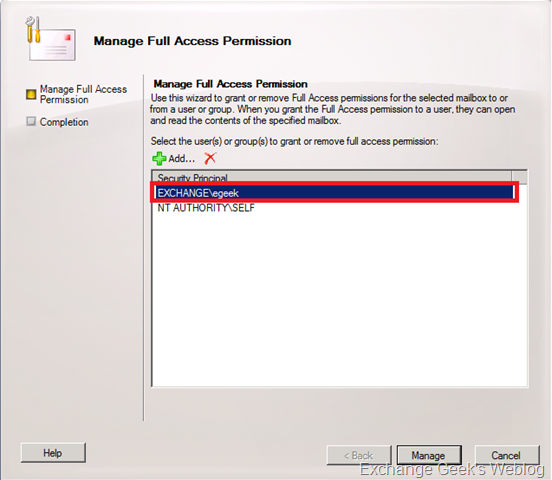 Exchange 2010 stores the full access permission in active directory. Simply similar to what Exchange 2003 or 2007 did. If you open the additional mailbox properties in adsiedit.msc you will observe the attribute msExchDelegateListLink having its value as DN of the user account who has full access to the additional mailbox. Outlook 2010 fetches this value automatically and configure an additional mailbox that you had added previously. When outlook profile is reconfigured, outlook picks up the additional information from your mailbox. Your mailbox now hold the information about the additional mailboxes that you added recently and didn’t remove them intentionally. 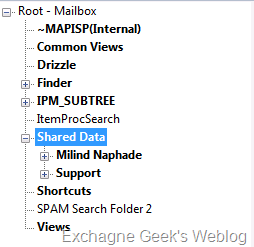 A new folder named Shared Data is created within the mailbox table which contains all information about the additional mailboxes that you ever added. I hope this helps people to prevent reconfiguring the mailboxes 😉 Please do let me know your comments and feedback if you have any. This entry was posted on 13/10/2010 at 4:33 PM	and is filed under Active Directory, Exchange 2010, Outlook. You can follow any responses to this entry through the RSS 2.0 feed. Both comments and pings are currently closed. Excellent info…. I liked the last portion….. This is very close to what I am experiencing, but what I need to do is to turn off this feature on my mail profile, there are mailboxes that I don’t want to open anymore that are still opening. It looks like can remove them using these instructions but what utility were you using in the bottom screen shot? 1. Remove yourself from Full Mailbox Access permissions of the additional mailbox. 2. 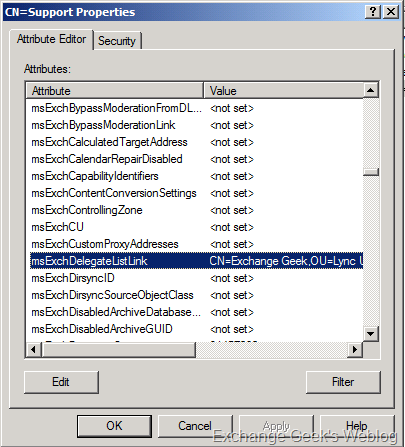 Check msExchDelegateListLink attribute on additinal mailbox doesnt not contain your user account’s DN. If it contains it then simply remove it. 3. Wait for AD replication to complete. The instructions worked, now my email looks as it should. i was curious about the second App, but yeah I was not very interested in the idea of having to use it, I was mostly curious if that was the way I needed to go.